Going through Germany this week I spotted this double page image in the current edition of Stern Magazine. 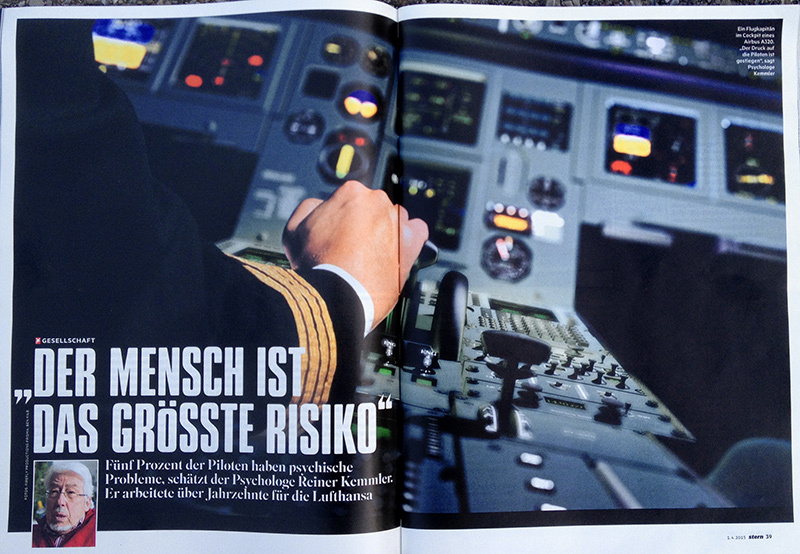 It is leading an article on airline safety in the wake of the tragic recent events on German Wings. I made this particular image of the cockpit of an Airbus A320 around 1998. I built the entire cockpit in 3D down to every screw in an early version of Cinema 4d XL. I then added the pilots hand from a studio shoot specifically for that purpose. Having the cockpit fully modelled in 3D enabled me to produce a variety of shots that would have been impossible to shoot in the confined space of a real cockpit – I know because I had tried. Although I had mixed feelings about my image being associated with this tragic event, it was nice to see how good the image still looked and also great to see how stock sales can still occur so many years after an image is produced.